My Imaginary Boyfriend has some interesting twists on Christmas favourites, including these Vintage Headphone Christmas stockings. 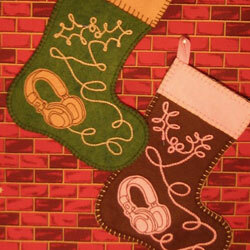 They’re crafted Christmas stockings, fully lined with hand-embroidered decorative work. Except, unlike traditional stockings, these bypass the reindeers and Santas, going instead for a pair of vintage headphones – with a bit of holly sneaking in there, courtesy of of the headphone cable. Each is 13.5 inches long and 10.5 inches wide and available in brown and pink. They retail for $60 (around £33) and ship worldwide.